Beebe Healthcare Welcomes the First Baby of 2017! Caleb Midash, weighing 6 lbs., 13 oz., was born at Beebe Healthcare on Sunday, January 1, at 11:26 a.m., to proud parents Heather and John Midash of Milford. Caleb is the first child for the couple. 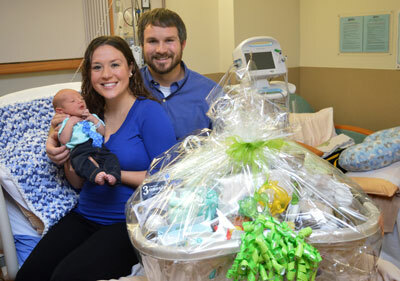 The Midash family was presented with a gift basket, which includes blankets, sleepers, and a Beebe baby onesie. The Beebe Auxiliary also donated a gift card to the family. Shown are Caleb, Heather, and John Midash.